Detail from St. Martha's House Brochure . Caption:"Little Home-Makers". 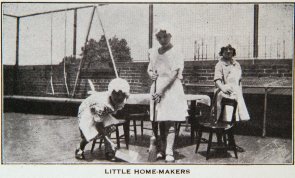 Girls, wearing maids caps and aprons, sweeping roof of St. Martha's House.